Today’s lack of established methodologies for evaluating and comparing the life cycle cost of extending an established distribution system to serve a significant load addition by either overhead (OH) or underground (UG) distribution, prompted DSTAR to develop a structured approach for this comparison. The software, SOCCS (System Owning Cost Comparison Software), is implemented as an Excel Visual Basic Application. 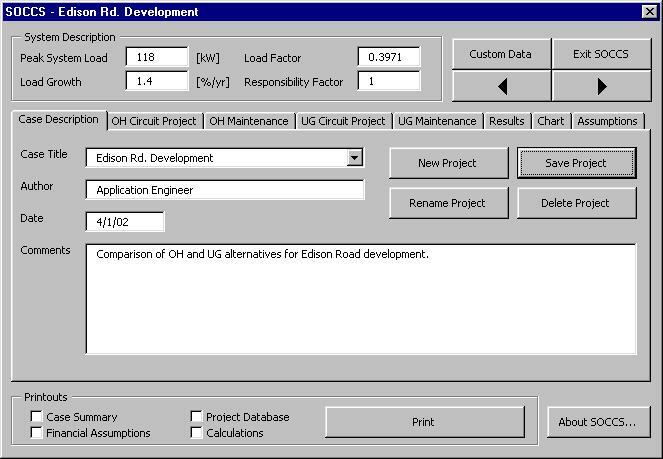 Its intended use is for life cycle cost evaluations of overhead and underground distribution system design alternatives. 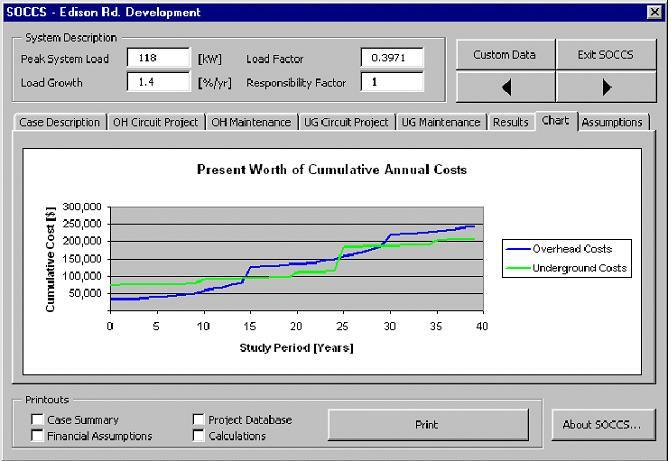 SOCCS calculates the total owning costs (TOC) of OH and UG alternatives, based on initial investment (materials and installation costs), and maintenance associated with each type of studied circuit. The maintenance and repair costs are, in turn, tied to fundamental parameters of the studied systems, such as circuit in miles and, number of services. Administrator for this program preloads the maintenance items appropriate for your area. The end user simply selects those items applicable for a particular studied circuit. The program is graphically oriented and user friendly. The window shown above is the main screen shot. SOCCS does not perform the distribution system design or initial construction cost estimation. The design is developed outside of the program, and SOCCS performs the life-cycle analysis using initial cost provided by the usr and maintenance cost provided by the administrator. For easy evaluation of the results, SOCCS provides the user with a graphical representation of the TOC of each system design over the study period.